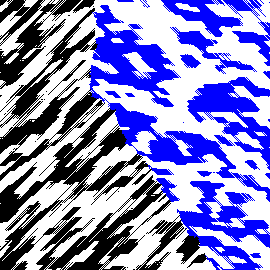 You are given a square black-and-white image divided into two parts, each part filled with its own texture. Your task is to separate the parts and return the corresponding marking of the image. You will implement one method recognize. image is a square image SxS pixels (S can be determined as number of elements in image), character j of image[i] representing the color of the pixel in row i and column j, '0' for black and '1' for white. You must return a marking of the image in the same format, '0' for a pixel that belongs to one texture, and '1' for a pixel that belongs to the other texture. It doesn't matter which texture you mark with '0's, the marking which results in higher percentage of correctly marked pixels is used. 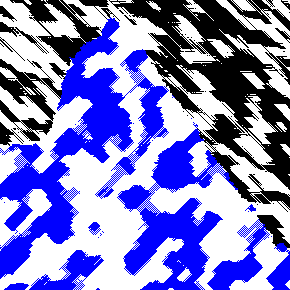 To generate a texture, the number of axes is chosen between 2 and 4, inclusive, each being vertical (dx=0, dy=1), horizontal (dx=1, dy=0) or diagonal (dx=dy=1 or dx=-dy=1). Several axes of the set can have the same direction. For each axis, its "weight" is chosen between 1 and 5. Note that the neighborhood of a pixel is a multiset and can contain each pixel more than once. 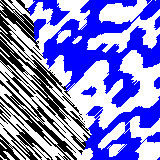 The initial state of the texture is generated randomly by assigning each pixel color '0' or '1'. 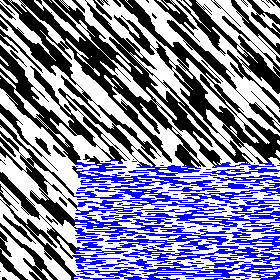 Finally, the image is inverted with a probability of 1/3. If this procedure produces more than two colored regions (a colored region is a connected component of all the same color), it is repeated from scratch. 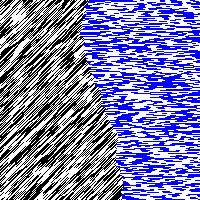 Finally, the black pixels are replaced with the pixel values from one texture, and the blue pixels are replaced with the pixel values from the second texture. Your score for an individual test case will be the number of pixels you marked correctly multiplied by 100/(S*S). Invalid return (wrong number of elements in return, or characters other than '0' or '1') will result in 0 score for that test case. Your overall score will be the sum of your individual scores. - The time limit is 10 seconds and the memory limit is 1024M. - There are 10 example test cases and 500 full submission test cases. 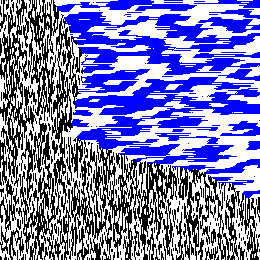 - For more details on the image generation, see the visualizer source. - S will be between 100 and 300, inclusive, and will be divisible by 10.